Most of the national economic news at year-end is trending positive, and indicators for 2010 are for continued growth, although at a slower pace. The national economic picture is unfortunately brightening at the same time the regional market is entering the trough point of the recession. While the hole in the bid market seems temporary, the overwhelming sentiment on the front lines has turned decidedly negative. Layoffs have occurred at many contracting firms, just as they did at architectural/engineering offices all summer; and the pool of available labor is growing for the first time in nearly half a decade. One source of objective data, the Pittsburgh Builders Exchange bid calendar, is showing that the negative sentiment may be oversold. Researching the number of projects bidding at year’s end showed 186 projects with bid dates in December. While that isn’t a project volume that will create a labor shortage it is 40% more work to bid than the 133 projects that bid in December 2008. Whether or not the prevailing sentiment shifts toward recession or recovery, one reality is that the slowdown in contracting in the second half of 2009, and the prospect of a lighter-than-usual bid schedule in the winter/spring of 2010 makes for a tough start to the New Year, with backlogs lower than in a number of years. Those companies which were able to build backlog have done so in a more competitive environment, and likely at lower margins than desired. A hallmark of the regional market at this stage of the business cycle is the intensity of competition for the projects that are available. A sampling of projects recently bid gives a good indication of how bid lists have lengthened. • A $4.7 million first floor build-out at the WVU Biomedical Research Center attracted 14 bidders, including generals from Pittsburgh, Maryland and Washington DC. • Heritage Valley Health Systems bid several projects in November and December. The hospital system historically bid their projects to two or three contractors, with two pre-qualified subcontractors for mechanical and electrical trades. The recent projects involve six invited contractors and almost a dozen subs. • The Penn State Gary Schultz Child Care Center, a $7 million building, was bid by 13 contractors, including firms from Pittsburgh, Chambersburg and Harrisburg. A similar size project in early 2008 drew four bids from local contractors only. This kind of market condition can be exciting for buyers of construction services, at least on bid day. For owners experienced with hyper-competitive bidding environments this kind of action also means much more work after the contracts are let, as contractors and subs will have no room for flexibility or interpreting intent and won’t be likely to pass up opportunities to regain reasonable margins. In the public arena, tighter bidding means that claims and change orders will be daily headaches. Residential construction in 2010 is set to pick back up, but the activity levels will remain anemic by historical standards. Single-family detached homes should again break above the 2,000-unit level but that volume remains well below the 3,600-plus units started at the high water mark in 2003. Housing permits declined 24% in Allegheny, Beaver, Butler, Fayette, Washington and Westmoreland counties. 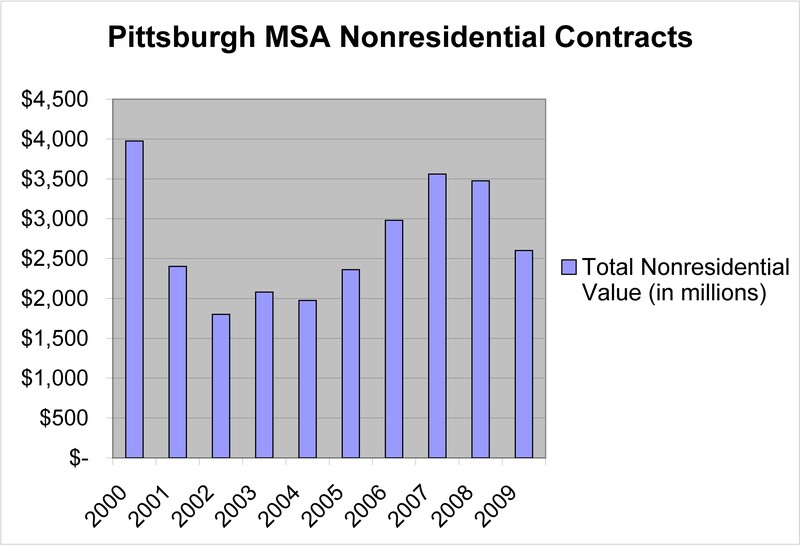 Nonresidential contracting volume was likewise off in 2009, with approximately $2.6 billion in total value. Missing from the mix in 2009 was the number of large projects that had begun in the preceding few years. Had one of the steel mill projects proceeded, however, the total volume would have masked the decline in overall opportunities. Assuming that one or more does get underway in 2010, the increase year-over-year will not be reflective of what will be a tough year for commercial construction. Contracting in the seven-county metropolitan statistical area pulled back in 2009 after a four-year growth run. This entry was posted in Regional construction, Regional Economy. Bookmark the permalink.